A quick recap of what started all of this – King Mohammed Sanusi II, in his former life as SLS, the Central Bank Governor, told the nation that, based on what he had calculated, NNPC sold $67bn worth of crude in the period from January 2012 to July 2013. He then said that as custodian of the nation’s purse, he had only received $47bn of this amount. In other words, up to $20bn of the money was not accounted for. Contrary to popular perception, SLS never did say the money had been stolen and he certainly didn’t name any names in his 300 page report submitted to the National Assembly. His main issue at the time was that, as CBN Governor, his job was to manage the exchange rate and the nation’s reserves. If there was $20bn out there in the wild, then his job was being made a lot harder than it needed to be. 1. Strategic Partnership Agreements – In 2011, as part of the efforts to promote local content, Shell sold its shares in 5 oil fields where NNPC was the majority shareholder. Shell had been the operator of these oil wells but NNPC awarded the operator rights to its subsidiary NPDC i.e. it allowed Shell to sell its shares but not the rights to operate them as it previously did. NPDC then signed an ‘agreement’ worth almost $7bn with Seven Energy (3 fields) and Atlantic Energy (2 fields) for them to operate the fields. These companies of course had no clue how to operate the oil fields – Atlantic was registered as a company the day before it signed the agreement – so they sub-contracted the work to other companies. Seven Energy’s contract entitled it to 10% of the profits from the 3 fields while Atlantic was entitled to 30% of profits in its 2 fields. SLS complaint was that these 2 companies were pointless and were just collecting money – that should have accrued to Nigeria – for doing nothing. Why didn’t NPDC just sub-contract the work by itself? The 2 companies also did not pay any taxes or royalties whatsoever to Nigeria. 2. Kerosene Subsidies – This one is fairly straightforward to understand. SLS did an analysis of kerosene prices in all 36 states of the federation in his report and found that prices ranged from N170 to N270 per litre. Importers bring in kerosene and sell it to government at N140/litre. The government then sells it to local retailers at N40/litre with the understanding that they sell it to the ‘common man’ at N50/litre i.e government subsidises it by N100/litre. The retailers take the kerosene and sell it for what they like as stated above. There is no sweeter corruption than this one. According to SLS, Nigeria was spending $100m per month on this pointless exercise. Not a single Nigerian anywhere bought kerosene for the ‘official’ N50/litre. 3. Swaps – Even with all the money going into NNPC, like a true apa, it is always broke. Due to the semi-dead refineries we have, NNPC of course has to import refined products (petrol and kerosene) but it often doesn’t have the money to pay importers in cash. So what it does it tell importers to import the refined products, then calculates the value of that product in crude oil and pays the importers with crude oil. This is how human beings traded before money was invented – by barter. The problem here is that SLS said he had no idea how the amount of crude to be swapped for refined products was calculated. All he was able to find was that at one point, NNPC was ‘swapping’ 200,000 barrels of crude per day. That is a lot of crude. Did Nigeria get that much value in refined products? Who knows? The first thing to note is that PwC was asked to investigate all money due to the federation from crude sales to see what had been remitted and what, if any, was outstanding. It did NOT investigate the swaps or the Strategic Partnership Agreements as those were not part of its remit. Somehow NNPC managed to overpay $740m to the federation account if we accept its own numbers. As we shall see; NNPC cannot count, it cannot buy, it cannot sell. Based on this, we can conclude that ‘no money is missing’ and close the case. Afterall, the numbers have been made to add up one way or the other – the $20bn that we thought was missing has been accounted for wan kain, as the outgoing President is wont to say. In other words – anyhowness. Between President Yar’Adua who cancelled the subsidy but did not gazette it (perhaps because he was trying to avoid a public outcry) and President Jonathan who ‘unlooked’ Yar’Adua’s cancellation, NNPC stuck its fingers in its ears and continued paying the subsidy. A lot of magic happened as a result. 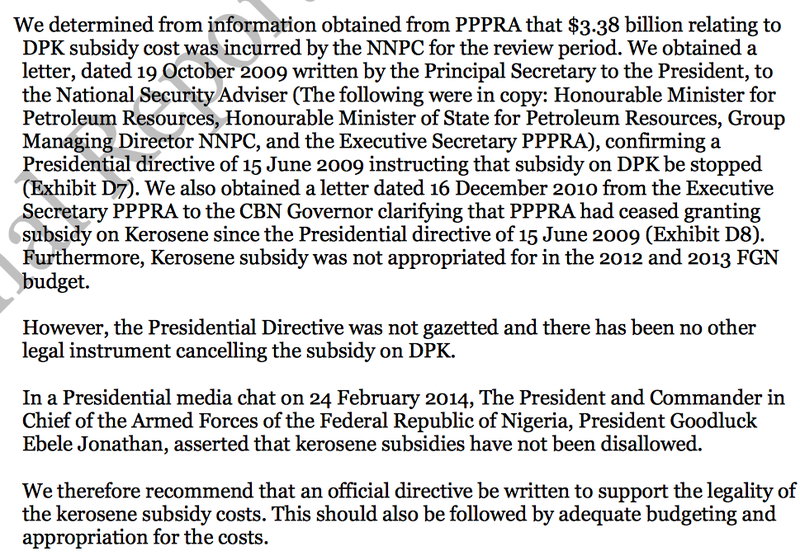 First, PwC found $40m of kerosene subsidy payments were duplicated (see above). That is, subsidy was paid to the same marketer twice or more for the exact same kerosene. This was apparently a ‘mistake’. But even if we accept this, there’s more. 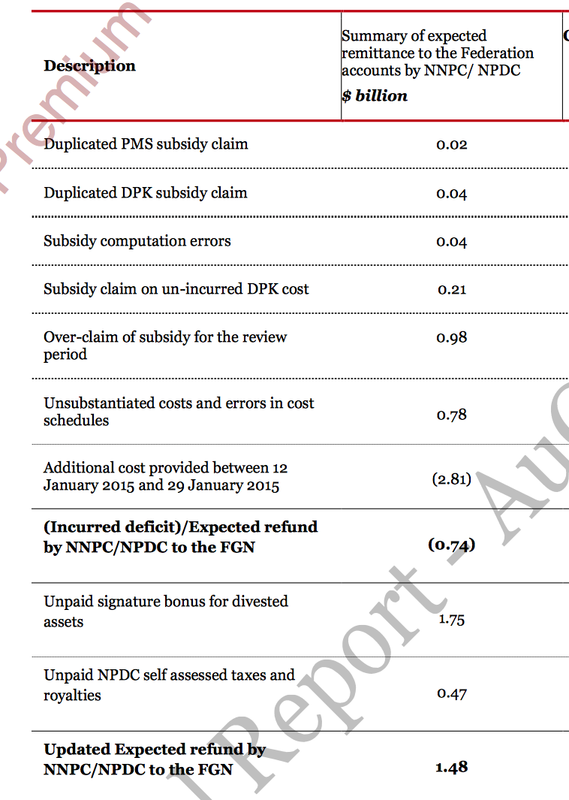 The table above shows how NNPC is supposed to calculate subsidy on kerosene. That N34.51 is what it costs to get it to Nigeria. In other words, NNPC is supposed to sell it to marketers at that price (N34.51) and the marketers then sell to consumers at N50 – the difference of N15.49 being used to cover all their costs and a profit margin. Instead, NNPC sells the kerosene to marketers at N40.90 i.e. taking some of the profit margin for itself. Why it does this, is a mystery. Nevertheless, when NNPC was calculating subsidy to be deducted (remember the yam and the goat are together), it used the figure of N34.51 even though it sold it to marketers at N40.90. In other words, NNPC charged marketers for a cost and also charged Nigeria for the same cost. This overcharging of subsidy on kerosene came to a cool $204m in total. It’s not easy for NNPC. When you are counting so much money, you are bound to make one or two mistakes here and there. It is these ‘mistakes’ that yielded the $1.48bn PwC asked NNPC to pay back to the federation. Some of these errors are as simple as wrongly adding a column in excel. These addition errors came to $40m. There was also the overclaim of subsidies on petrol and kerosene (as described above). As well as other monies that should have been paid to the federation and were not paid. 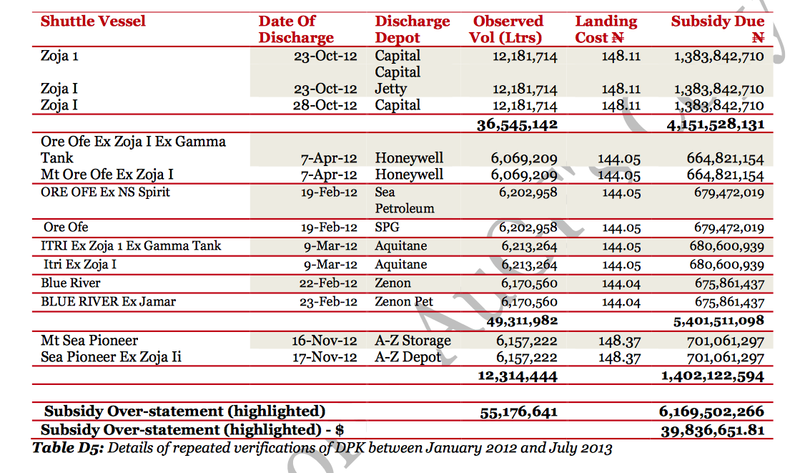 The table below shows the breakdown of the $1.48bn. One must ask – if PwC hadn’t gone in to audit the place, would NNPC have just let a $40m addition error go on like its nothing? The mind boggles. As an auditor, when someone tells you they have spent this amount of money, what do you do? You guessed right, you ask for receipts. Perhaps it thought PwC won’t ask for evidence. Some of it is quite hilarious (one must laugh when one cannot cry). In January and March 2012, it claimed to have paid salaries totalling $14m. No evidence to back it up. In November 2012, it claimed to have paid another $6m in salaries. Again, no evidence to back it up. Who was it paid to? Mr Who. Almost $60m went on ‘charter hire’. To charter what? When you find out, tell me (Actually I know what this ‘charter’ is – it is the payment for the Petroleum Minister’s jet i.e. NNPC was paying for the cost of purchasing the jet on her behalf. But please don’t quote me). For January 2013, it entered a cost of $31m. But PwC found that this was the same cost it had claimed in 2012. When asked for the evidence for the January 2013 payment, it presented the same evidence as the one for January 2012. It claims to have spent $2.6m on buying cars. No evidence. $48m ‘right of way’ costs. No evidence. And so on and so forth. Also, as you can see from above, in return for all the selfless and glorious work NNPC is doing for the country, it paid itself a total of $1.5bn in salaries for the 18 months in question that PwC looked into. When some people commit murder in broad daylight. They don’t run away. They light a cigar and sit down beside the dead body waiting for police to arrive. When the police arrive and ask who killed the person, they confidently say it was them. People like these are known as bad guys and NPDC is one of such people. NPDC refused to cooperate with PwC for the audit. It did not submit any information or provide any help. 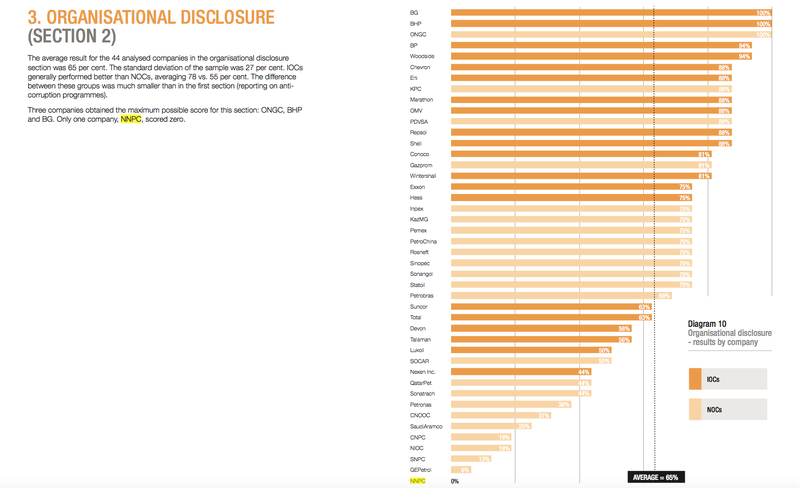 PwC then had to obtain information from a variety of sources (including NPDC’s website) to try to ascertain how much exactly it should have paid to the federation. NPDC was summoned to the Senate sometime last year and they gave a presentation of their operations. 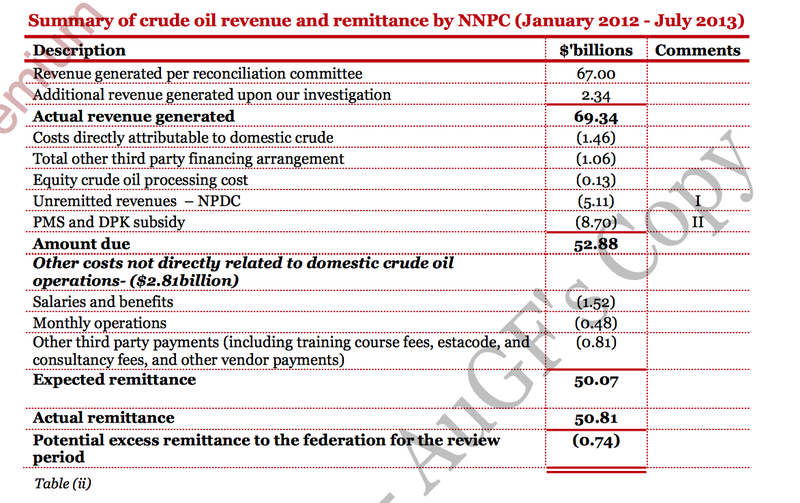 The $6.815bn figure above in the NPDC column is what they claimed as the amount of oil they lifted. PwC also tried to verify this with the Department of Petroleum Resources (DPR) who gave them the $6.886bn figure. Finally, PwC tried to calculate the figures themselves and ended up with the $5.6bn figure. Because they are bad guys, NPDC calculated their own tax and decided that the amount they owed to FIRS in taxes was $1.14bn. 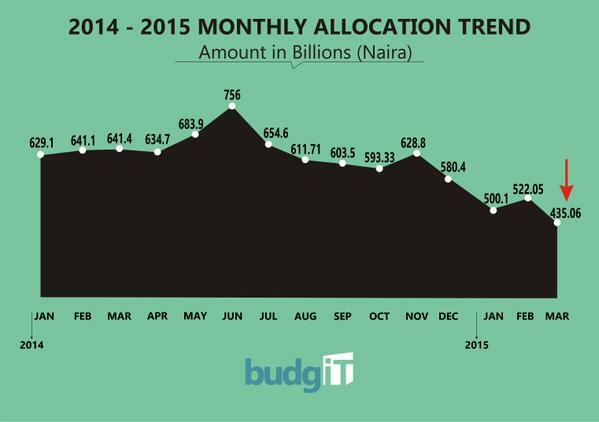 Out of this amount, they claimed they had graciously paid $863m to FIRS but do not yet feel like paying the rest. However, it was discovered that the actual amount paid was $838m – the $26m difference being due to a ‘mistake’ in counting the same payment twice. Please don’t shout at them so they don’t get angry and refuse to pay the rest of the money. All told, NPDC is holding on to $5.11bn that it has not remitted to NNPC (NNPC is the owner of NPDC so it should collect the money from NPDC and send to the federation account). This is PwC’s conservative estimate of what NPDC has withheld from Nigeria. Perhaps when the time comes for them to pay the money, in keeping with the goat and yam principle, they might tell us that they spent half of it on ‘costs’ and can only remit $2bn or something. We await that day. Other monies are missing. But what can we do? This is the tragedy of the goat and the yam. NNPC claims that crude oil theft and pipeline vandalism cost it $760m in the period in question. It is unfortunate. Sorry. NNPC also holds strategic reserves of petroleum products for the country. It is not free to hold these things and so the holding costs amounted to $460m in the period in question. 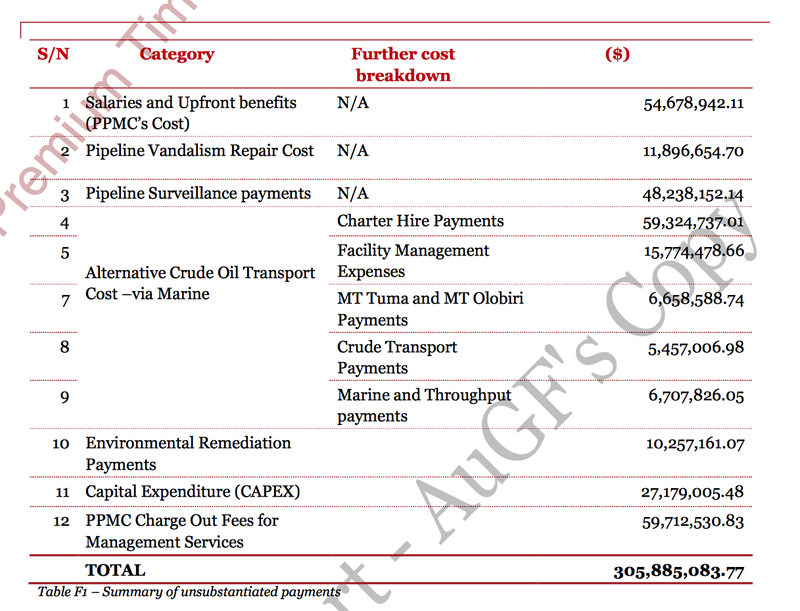 These costs are made up of demurrage costs ($207m) and charges by Nigerian Ports Authority ($252m). Of the demurrage costs, $64m could not be verified while the entire $252m claimed to have been paid to NPA could not be supported by a single document as backing evidence. The rest of the points raised are not things I understand very well so I have skipped them. But I think the above captures the gist of what has gone on. So what can we do about this goat of a corporation? The rot in the place must be from ceiling to floor and you really cannot jail everybody there. A lot of the missing money will also never be recovered. So as much as people must be decisively punished for what has happened, how do we move ‘forwards’ and ensure this doesn’t happen again? 2,300 words is enough for one blog post so watch out for Part 2. As the gist goes, Lagos is what it is today because it benefitted from being the Colonial and Federal capital. This is why it is more ‘developed’ than anywhere else in Nigeria. Indeed, that is what Ms Adichie is saying above – that it is the political history of Lagos that sets it apart and why it is like no other city in Nigeria. Well, Lagos is certainly like no other city in Nigeria for sure. But is this because of its ‘political history’? That is, if Lagos was never the capital of Nigeria, would it still be Lagos as we know it? Would another city have developed further than Lagos if it had been chosen as the capital? The best way to answer a question like this is to try to figure out why Lagos was chosen by the British as a capital in the first place. And the answer to that lies with geography. I try to avoid economic theories linked to geography as much as I can because it is too deterministic and people then focus on the problem and not the solution. But this is important. Hooked up to four powerful tugboats, the World War II aircraft carrier Intrepid began what could be its final cruise on Thursday – a return to the Manhattan pier where it has served for 24 years as a military and space museum. Lines were cast off at a Staten Island naval pier, freeing the ship for the five-mile trek up New York Harbor and the Hudson River. You can click on the link above to see some photos of the ship being tugged to the museum. The ship itself, USS Intrepid, has a Wikipedia page which tells us that it had the capability of carrying up to 100 aircraft and weighed almost 37,000 tonnes with a full load. It was also 266 metres in length and about 45 metres high. I think we can conclude it’s a pretty big ship. Yet that giant of a ship was being towed into close to midtown Manhattan in New York. Can such a ship dock anywhere inside Africa? The answer is no. And it is not for lack of facilities or ports to handle its size. In some ways Africa has been dealt a tragic hand by geography – more than half of the continent is at least 2,000 feet above sea level. Indeed, most of the continent is at least 1,000 feet above sea level. Of course, the higher above sea levels you are, the higher your waterfalls and cascades where rivers meet or drop into the seas and the oceans. This helps to explain why many of the rivers in Africa are not really navigable and the general scarcity of harbours. That is why you cant really get a ship the size of USS Intrepid to dock inside any harbour in Africa. Consider the River Niger – the longest river in Sub-Saharan Africa at 4,200km long – It starts in the Highlands of Guinea which is a dizzying 5,800 feet above sea level before entering the Atlantic Ocean, obviously at sea level. This is not an easy river to navigate and it confused the Oyinbo explorers for a long time. All of this matters economically. Before humans came up with trains and aeroplanes, the only way to get around was by sea. It was what made a lot of trade possible as well as migration. Where rivers were treacherous and impossible to navigate, it meant that a lot of places were culturally isolated for a long time and were at great risk of coming under attacks as a result. It might also explain why a continent with around 15% of the world’s population has over 30% of the world’s languages. Obviously the most efficient route to the coast for the ore has to be through Liberia. 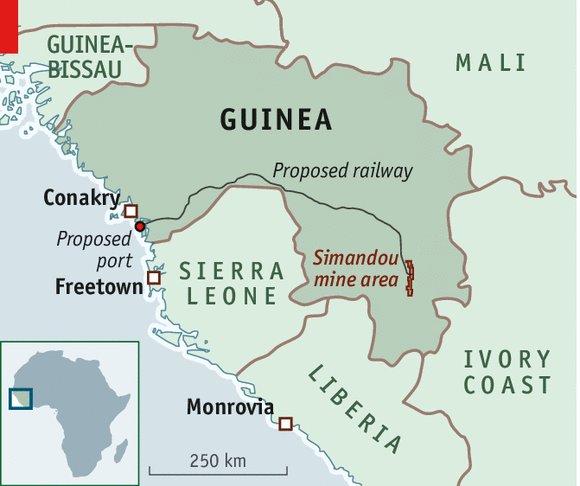 But if you were a Guinean, would you agree to building a port in another country to transport your ore? Exactly. So this route through Guinea will cover 650km of railway lines with 35 bridges and 24km of tunnels at a total cost of $13bn (just for the infrastructure alone). When Guinea will start making money from that ore is anyone’s guess but it won’t be anytime soon. Now, you are free to assume that the British were stupid for choosing Lagos or perhaps they drew lots and decided on which part of Nigeria to land in – no one will stop you from thinking that way. But these are the facts – the highest point in Nigeria is Chappal Waddi in Taraba State which stands at almost 8,000 feet above sea level. And the lowest point? Lagos Island at almost 1 foot below sea level (click-through the wiki link and have a look at the African countries on the list). Compared to today, there was no sophisticated shipping technology back then so the British naturally used the best access point from the river as their base. Lagos had a natural geographical advantage. Lokoja was a capital before Lagos but the difference in both cities today, tells us that economics trumps politics over the long term. So where does this leave us? Is a natural geographical advantage the be all and end all of economic development? Absolutely not. Our purpose on earth is to defeat brute nature. Central heating has made it possible to live productively in certain countries in the world such as those in Scandinavia. Without air conditioning, the US South would seriously lag behind the rest of America today economically. In the time of the Tang Dynasty, China was so hot that an inventor named Ding Hua came up with an air conditioning system and an Emperor later had a ‘cool hall’ built in the imperial palace. Go to Miami today and you will lose count of the number of man-made islands there. Humans have learnt how to create lakes too and build whole cities out of the ground. In 1965, Singapore’s land size was 58,000 hectares. Today it is 71,000 hectares and it plans to add another 6,000 hectares by 2030. Much of this has been achieved by importing sand from other countries. The invention of the elevator made it possible to pack human beings more densely in cities which are much easier to administer and build infrastructure for. The list of places and situations where humans have beat brute nature is endless. But is it to strange for a country to have a dominant city? Does this always happen at the expense of other parts of the country as is the narrative these days that Lagos was developed at the expense of other parts of Nigeria because it was the capital? The UK’s GDP is around $2.5trn. London alone accounts for close to $800bn of that. The biggest infrastructure project in Europe right now – Crossrail – is happening in London and the High Speed 2 train planned will link the rest of the country to London. It is not because Bristol or Manchester do not need new train networks but because building a country does not have to be zero sum and strong economic centres are not so easy to replicate. And often, the answer lies in history and economics and not politics. Believing that a thriving economic centre can be created by politics is a journey that leads down the garden path. Reducing the importance of Lagos to a political creation is an economically illiterate and depressing argument to be having. Lagos does not exist at the expense of anywhere else. People make money in Lagos and go and spend it elsewhere in the country. People come to Lagos for opportunities daily – it’s a big market and its density means that infrastructural challenges are not a barrier to getting goods and services to people as they might be in other parts of the country where people are widely dispersed. Lagos is an advantage and benefit to Nigeria and it should be maximised as much as is humanly possible. Oba Akiolu’s comments were deeply irresponsible and offensive. But Lagos is far better than his comments and it should not be reduced to his level. And certainly it should not be an excuse for people on both sides to bring out their prejudices in the sunshine. There’s a country to be built and it certainly wont happen by half-baked theories used as a wrapper for people’s prejudices. P.S – I’m from Ondo. Last time I went there, it looked so depressing and hopeless to me. If you ask me the best way to develop the place, my answer will be to find a way to connect it to Lagos as quickly and efficiently as possible. Enough said. 2. Between 1870 and 1910, over a million Swedes (around 20% of the country’s population at the time) abandoned Sweden for a new life in America. They left a country that was a pretty poor and dark place and suffering repeated crop failures, for the chance of a better life in America. In 1870, Sweden had a GDP Per Capita of less than $1,500 — not far from where Nigeria was before our GDP rebasing. Today, their GDP per Capita is over $60,000. By the numbers, it has gone from a poor country to a very rich country in just over 100 years. All of that transformation — from a country people were fleeing to a magnet for immigrants today — happened while Sweden has been a democracy. It is fashionable for people to yearn longingly for an authoritarian ruler in the fashion of Lee Kwan Yew who will drag his country to prosperity. But just as it is never reported on the news when aeroplanes land safely, no one really talks about countries that have gone from poverty to wealth while being democracies. The excuse that being a democracy makes it hard or impossible for economic reform and development cannot be valid. It can be done. And you must stay within the powers granted you by the constitution – they are there for a reason, mainly to protect the people from the raw naked power of your office. Nigeria has chosen the path of democracy. There is no longer room for any type other of government. This is what we have and it is what we will develop with, come hell or high water. 3. A few days after General Park Chung-hee took power in South Korea in 1961, he began to arrest a number of businessmen and crony capitalists under a law known as ‘Special Measure for the Control of Illicit Profiteering’. An old prison in Seodaemun which had been used by the Japanese during their occupation of South Korea, was converted to a special prison for crony capitalists and businessmen who had benefitted immensely from the previous government. To all intents and purposes, it was an anti-corruption crackdown by General Park. But that was only half the story. A few months after taking power, General Park published a book titled ‘Our Nation’s Path: Ideology of Social Reconstruction’. The book promised a ‘miracle on the Han River’ and building up South Korea into a ‘mammoth economic strength’. Taken together, General Park did not launch an anti-corruption just for the sake of it. He did it to bully those who might otherwise have been enemies of progress, into supporting his vision of turning South Korea into a ‘mammoth economic power’. The threat of prison was enough to turn rent seekers into manufacturers and exporters in short order. Yes, a big part of why you have been elected is to get a handle on the corruption which has decayed our country and now threatens to bring the whole structure down. But simply waging war against corruption without a vision of where the country should be going will become no more than a moral crusade. Being tough on corruption will give you a massive chance of pushing through the reforms needed to unleash the animal spirits of the Nigerian economy and put the country on the path to economic development. General Park’s grand vision was to turn South Korea into an exporting economy. By the time he had finished dealing with the crony capitalists under the guise of anti-corruption, the results were good enough for him to declare, in 1964, every November 30th as ‘Korea National Export Day’. Today, there are few countries on earth you will visit where you won’t find Korean phones, electronics, cars or even ships. And General Park has been dead since 1979. Chart a new course for this country so that the crooks you want to set straight (most of whom are much younger than you), simply don’t go and hide somewhere waiting for you to leave the scene so they can return the country to ‘business as usual’. If you punish a particular type of behaviour, you must promote an alternative that will be there long after you have left office. 4. The fact that an idea has been tried several times and failed woefully each time does not mean that someone will not attempt it again. Failure, after all, is relative – that something has failed millions of Nigerians does not mean that it has not been an unqualified success for the select few benefitting from that failure. Between 1958 and 1961, around 36 million people died of hunger and physical abuse in China as a result of the Great Famine brought about by Chairman Mao’s ‘Great Leap Forward’. Partly to cover up the failure of the policies that led to that famine, Mao doubled down and launched the Cultural Revolution which ran from 1966 to 1976 and persecuted millions of real and perceived enemies. Yet, after Mao died and Deng Xiaoping took over, there were still many many people who wanted to continue his failed policies perhaps because changing course would mean an admission that they had failed. It fell upon Deng to find reformers and back them with all his political will. Some felt the economic reforms were too radical, others felt they were too timid. Chen Yun was a respected economist that Deng could not afford to alienate – he fell into the former camp of those who were skeptical about reforms. But there was also Zhao Ziyang who was very critical of Mao’s policies and was a proponent of bold agricultural reforms. He received the backing of Deng and his agricultural reforms were so successful that Chinese people came up with a saying ‘yao chi liang, zhao Ziyang‘ translated as ‘If you want to eat, look for Ziyang’. The people who had previously starved to death under Mao, knew exactly what they were talking about. In the end, the anti-reform crew got to Ziyang but by then it was too late to reverse his reforms. Mr President, you must never run out of political will with which to back the Ziyangs in your government. The change we need in Nigeria goes beyond simply changing the government or ruling party. We desperately need reforms of our laws and how our government sets about tackling the issues plaguing the country. Reform will never be easy (an outgoing minister even reckons some things are unreformable in Nigeria), but you must try. And you must never stop. You must find and protect your Ziyangs before the enemies of progress get to them. Those were the words of Deng on the day he took office. The result is there for all to see. 5. You have wanted to be President since 2003. The problem is that, depending on how one looks at it, the problems you wanted to solve in 2003 are now bigger and more complex. It is now when the problems – of insecurity and corruption and economic mismanagement – have gotten out of hand, that Nigerians have, perhaps in desperation, called you. There are several things this tells us. One is that as long as the problems were ‘manageable’, Nigerians did not need your services. People who behave in this way are likely to get impatient very quickly. It has only been about 2 weeks since Fulani herdsmen attacked a community in Benue State, killing 80 people. It is this same state that you, a Fulani man, just won in the election. Our country is desperate to do better and it has called on you to do the job. The job is going to be incredibly difficult bordering on the impossible and frankly, it would have been better for you to have been elected in 2003 when some of these issues hadn’t compounded to where they are now. And yet, as of today, there is nothing stopping you from ending your time in office as Nigeria’s greatest ever leader. The slate is currently blank. Draw inspiration from another man who, by the time he had finished his 8 years in office as his country’s President, was freely being referred to as ‘the best President ever’ by his countrymen. He increased the average number of years each child spent in school from 5 to 8 years. The number of homes with a functioning and proper connection to the sewage system increased from 37% to 51% under his watch and the number of homes with washing machines went from 24% to 44% of the country’s total. The percentage of the population living in poverty dropped from 32% to 15% in his 8 years in office. That percentage drop translated to 20 million people who were able to move up out of the indignity of poverty and participate in the country’s economy. Like you, he only won the presidential election at the 4th attempt in 2002 after trying and failing in 1989, 1994 and 1998. His name of course is Luiz Inácio Lula da Silva. There is a tide in the affairs of men. Which, taken at the flood, leads on to fortune. Omitted, all the voyage of their life is bound in shallows and miseries. On such a full sea are we now afloat. And we must take the current when it serves, or lose our ventures. According to the books of our ancestors, Kings would hold court out of doors, seated on horseback atop a tall platform so as to distinguish from among all the people gathered in the plain those who were suffering oppression and to give them justice. The reason for this custom was that once a King retires to a residence where doors abound, and barriers and vestibules and hallways and gates, men of ill-will and perversity can bar people’s entrance and keep them from lodging complaints with him. How you choose to govern such that you are not captured behind doors and vesitbules and hallways and gates, will require plenty of wisdom. But it must be done. Some say this is one of the main reasons you have just kicked Goodluck Jonathan out of office. It will be utterly depressing if you fall victim to the same disease. I am not aware that it is possible to campaign in back to back elections on the theme of change. That is, though you have won the elections by campaigning for change, in 4 years time, you will be on the receiving end of the change message while you convince Nigerians of the need for continuity. ‘Twas ever thus, Mr President. I got some ‘congratulatory’ messages too and all I did was tweet and make a few phone calls on your behalf. Now that we have seen that it is possible to unseat a President from office for non-performance, I am afraid that this has put a limit on the amount of intellectual dishonesty that is possible in your defence even by your die-hard fans. I wish you all the very best. ‘Life is to be entered upon with courage’ as Alexis de Tocqueville once said.